This Atlas has revolutionised our knowledge of breeding Greylag Geese in the county. Our First Atlas showed birds present in 31 tetrads, with breeding proven in 10 and probable in a further 8. But since then, presumably because of many birdwatchers’ usual scorn for introduced/ escaped species, annual bird reports have contained almost no information. From 1985 to 1994 there were no published breeding records whatsoever, and in the nine years 1995 to 2003 observers submitted reports of just twelve breeding attempts in total. The picture revealed by fieldwork for this Atlas shows Greylag Goose with breeding season presence in 119 tetrads, out of which breeding was proven in 29, probable in 69 (mainly records of pairs) and possible in 21 tetrads. They have increased greatly in numbers and range since our First Atlas, spreading out from their original stronghold on the Eaton Estate to colonise most of south and west Cheshire, the mid-Cheshire sand-quarries, parts of the south Manchester fringe and western Wirral. Their status in the county appears commensurate with the picture elsewhere. From 1991 to 2000 the national population grew at a rate of 9.4% per annum, giving a doubling in eight years (Austin et al 2007). The Cheshire and Wirral population is not known, but is likely to be more than 200 breeding pairs. The national surveys show that the greatest increase in Greylag Geese came from an expansion into lowland habitat with some water cover. Most of the county’s birds are in low-lying areas, but they were reported at all altitudes from the lowest to the highest waterbodies in the county (Lamaload Reservoir). The dystrophic upland reservoirs are not very suitable for waterfowl breeding, though. The submitted habitat codes show no obvious habitat separation from Canada Geese, although Greylag have a tendency to use larger waters: 48% of Greylag Geese were on G3, G4 or G5 compared to only 31% of Canada Geese. 82% of the submitted habitat codes were freshwater (74% on ponds, lakes, meres and reservoirs and 8% on linear watercourses, mostly rivers and large canals); most of the remainder (11%) were agricultural grassland. They only need sufficient water to provide a nesting site safely away from predators, especially foxes, and somewhere for them to retreat to overnight. The geese and their goslings feed mostly by grazing short-cropped grass but head for the water whenever danger threatens. They usually nest in April, on the ground, preferably on an island if at all possible. Greylag Geese typically lay 5-7 eggs, incubated by the female for four weeks. From the moment they hatch, their downy young can walk, swim and feed themselves but it is seven to nine weeks before they can fly. 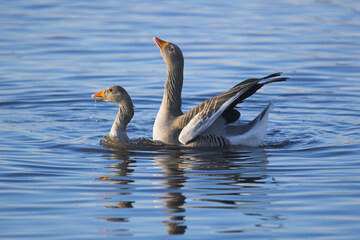 This long season gives fieldworkers ample time to find the species and the low proportion of confirmed breeding records (only 25%) is probably explicable by their delayed maturity, Greylag Geese not normally breeding until 3 years of age, with consequent large numbers of non-breeding sub-adult birds.